Both Columbia County and the county seat of Hudson were named after explorers. 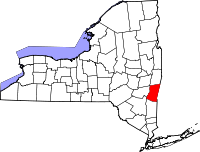 The county derived its name from the feminine form of Christopher Columbus, and the county seat was named after Henry Hudson. The Hudson River's name also has the same origin, and the river is, in fact, the western border of the county. The Columbia County Historical Society maintains a records archives at its library at 5 Albany Avenue in the town of Kinderhook, as well as providing a large number of records online. At the library are the Society's genealogical resources which include over 200 family genealogies, census records from 1790 to 1830, 1870, and 1910, over 200 cemetery records, historical newspaper clippings with special emphasis placed on deaths and marriage notifications, and much more. The Society accepts research requests submitted either through email or regular mail, and the minimum research charge starts at $25.